In case you’re not a dice person, a “Hard Eight" is a roll in craps. It’s two fours – they add up to eight, and the matched pair makes them hard. Games on the Down Low has taken that single roll and built a fun new drop/match game out of it. 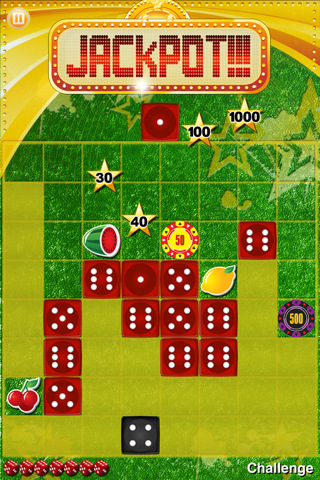 Your goal in Hard8 [$0.99] is to drop dice on a play field and make matches that add up to eight. Soft Eights clear themselves, Hard Eights clear everything around them. The developer describes Hard8 as “Drop7 on steroids," and I’d say that hits pretty close to the mark. Both games ask you to employ some basic number skills to create matches. Both also use a field that climbs toward the top of the screen. But Hard8 adds a few bells and whistles that take it to the next level. Take Hard8’s three game modes. Two will be familiar to Drop7 players. In Challenge mode, you make as many matches as you can until one of your dice hits the top of the screen. Tournament mode is like Drop7’s Sequence mode – the same as Challenge, but your drops always follow the same pattern. This lets you compete for high scores knowing that your competition isn’t just luckier than you. 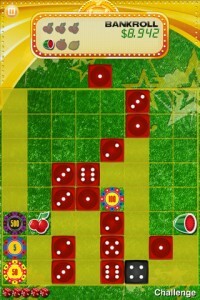 On top of that formula Games on the Down Low added Puzzle mode, which includes 14 levels with pre-designed fields. You have to use a lot more strategy to deal with them, because you might be starting with half your screen pre-filled. You’ll need to collect all the diamonds in the level to win, and most of them start below the field of play. Hard8 also scatters a few powerups in as rewards for good combos. All of this is rounded out with a huge collection of leaderboards. Each mode and each puzzle has its own leaderboards, with daily, weekly and all time scoring. Puzzle scores are a bit weird – you can keep earning a higher score by refusing to drop a dice on the last diamond for as long as possible. But generally, the competition is fierce. Hard8 also has 20 Game Center achievements to earn that reward both skillful and persistent play. I’m pretty hooked on this game, and I haven’t encountered much that gets in the way of my fun. The game can be a bit laggy when you launch it, though most people report that it clears up quickly. Hard8’s casino theme is a touch too true-to-life. The visuals are a kind of garish and the music gets grating after a while. Apparently Games on the Down Low has already submitted an update to let us listen to iPod music instead, so that should help. They’re active in the Hard8 thread on our forums, too. If you like dice games, drop/match games or high-score competitions, I’m not sure how you’ve made it this far without hitting that “BUY" button. Are you holding out for an iPad version? Apparently one is in the works. Otherwise, Hard8 isn’t much of a gamble.